Bigfoot Evidence has posted the following video from Rocky Mountain Sasquatch Organization. The RMSO claim to have captured Bigfoot’s shiny eyes during one of their expeditions into the wilderness of America. The 47 minute video (seriously, when did Bigfoot videos turn into featured films?) shows a lot of nothing in its entirety except for the last few minutes of the tape. Where at the 46 minutes and 15 seconds mark two little shiny eyes appear in the branches. Since the 1970s there has been a plethora of new techniques, tools, and armchair-researchers that have flooded the Bigfoot realm. Especially during the last 10 years. However, regardless of the nifty little flying drones they have or the night-vision tools they use in the dark woods, there has been little to no progress scientifically speaking. Sure there are those like Jeff Meldrum that ensure proper scientific analysis is used when examining evidence but that’s just about it. So what we’re left with is shoddy evidence by untrained researchers that gets passed around the internet as “Proof positive” of the big hairy one’s existence. The RMSO’s expedition yielded nothing by two shiny eyes at the end of the video. 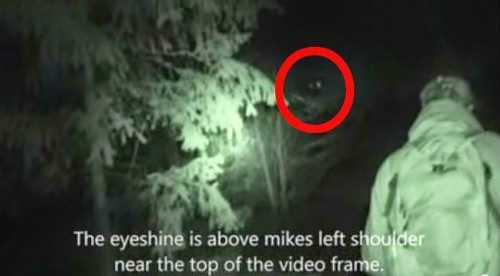 The eyes (which could have easily been a bird perched on a branch) were said to be 9 feet off the ground, so therefore they introduced the possibility of the eyes belonging to Bigfoot. Regardless of the advancements in technology nowadays, there is no substitution for meticulous scientific research when it comes to providing evidence to the world. Posted in BigfootTagged Bigfoot, Cryptozoology, Unknown PrimatescommentLeave a Comment on 2014: Bigfoot’s Eyes Caught On Camera?